Early exposure to the visual arts promotes activity in the brains of young children, by encouraging their capacity for critical thinking. Participation in art making helps equip young children with the necessary tools to build a strong foundation for creative problem-solving and communication skills. 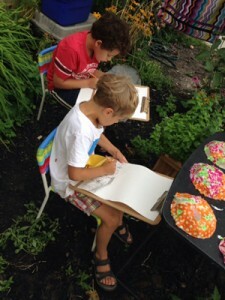 As children make art, they utilize imagination and inventiveness through explorative play. This natural play provides children a language with which they can readily communicate confidence, competence and self-esteem. As children grow older this language of play matures and they begin to develop a more expansive visual vocabulary. With maturity also comes the acquisition of new dialects, which results in physical and cognitive growth. Growth during childhood, often measured by the achievement of milestones, is perhaps best captured and immortalized through a child’s artwork. As loose scribbles transition to basic shapes which later transition to symbolic representations of their world, a child’s artwork functions as a premier record of their growth. At the Children’s Art Studio Inc. we are dedicated to nurturing and heightening development in every child and achieve this goal by utilizing the process of documentation. In our studio, documentation refers to the process of observing children as they engage in art making to create records of their experiences. Through photographic observation, we are able to deepen our understanding of children’s individualized growth and development. Our documentation process illuminates studio experiences and offers insight about the ways our students explore, experiment, understand, and create.